If you're like me and your husband isn't a very adventurous eater, you have make less-than-normal food when he's not around. Last night E stayed late at school working on a paper and I took the opportunity to cook something I knew he probably wouldn't enjoy. 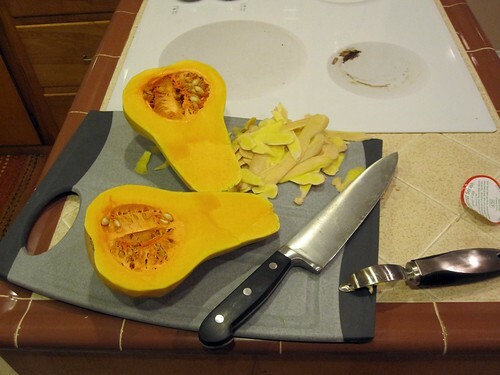 I've never cooked with butternut squash before, but I grabbed one on a whim in our local market last week. I found this recipe and figured why not spend the evening in my kitchen. I cut the recipe in half and modifications based on what I had in the house, so below are my modifications: click on the links for the originals. 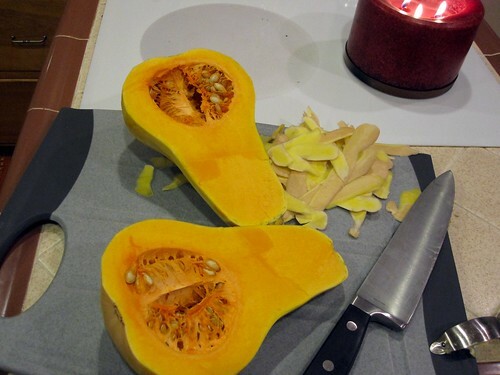 Peel and slice a butternut squash, scooping out the insides. 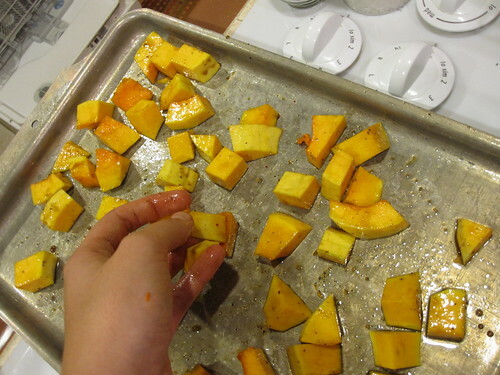 On a side note, I have spent too much time with my hands covered in squash goop in the last few days. Here's a great food photography nugget of advice I'm sure you'll all appreciate. When you have an embarrassingly dirty stove top and you are taking pictures for your blog, roam through the house to find a large candle to cover up the mess. I'm willing to share my kitchen mess just to give you that bit of advice. You're welcome! 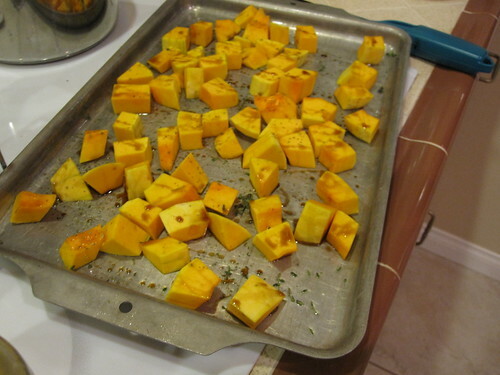 After cutting the squash into bit size pieces, spread about 2/3 of the squash onto greased cookie sheet and sprinkle with syrup (I just added extra flavoring to fake syrup bc we didn't have real maple syrup), and fresh sage or thyme. Toss and place in oven for 15 minutes. in the meantime, start salted water boiling on the stove. 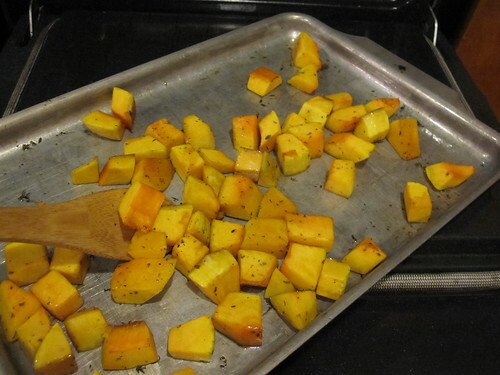 When the over timer goes off, toss the squash again with a wooden spoon and put back into the oven for 10 minutes. 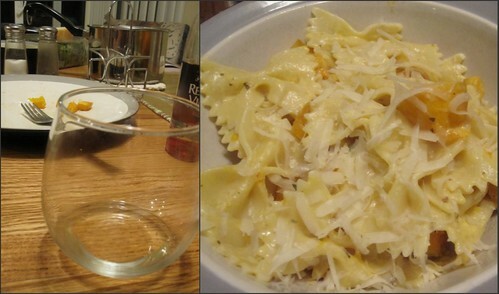 Throw your farfalle into the boiling water and start the sauce. 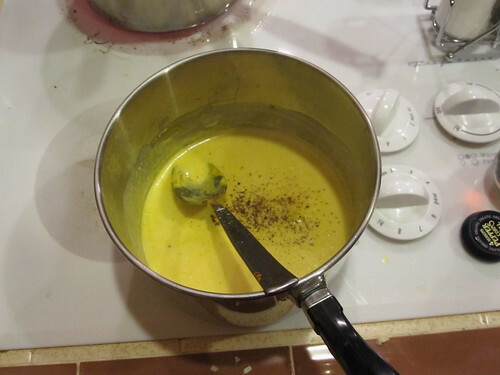 On medium low heat, warm up 1/3 c of heavy cream. Then add 1/4 c. pumpkin puree (I had some pre-made from my pumpkin cookies), a heavy dash of salt, pepper and a light dash of nutmeg. Mix until incorporated and then grate 2-3 tbls of fresh parmesan into the sauce. 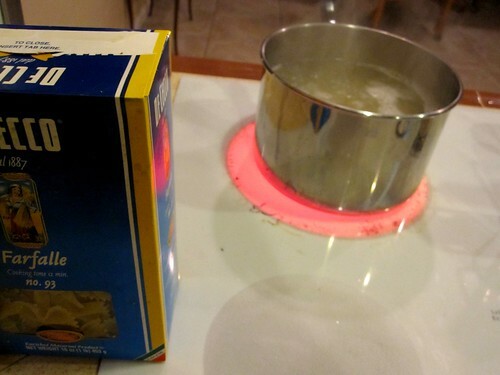 Turn off heat and stir to melt and incorporate the cheese. 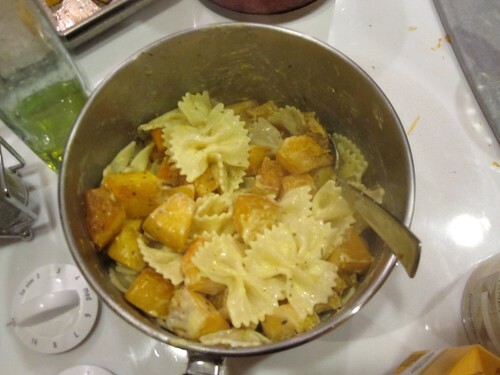 Drain the pasta and return to pan, dump in the roasted squash from the oven and pour sauce over them. Toss to coat the pasta. 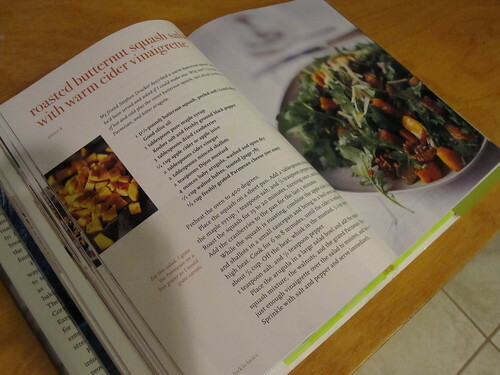 My salad was very (VERY) loosely based on this recipe from a wedding gifted Barefoot Contessa cookbook. 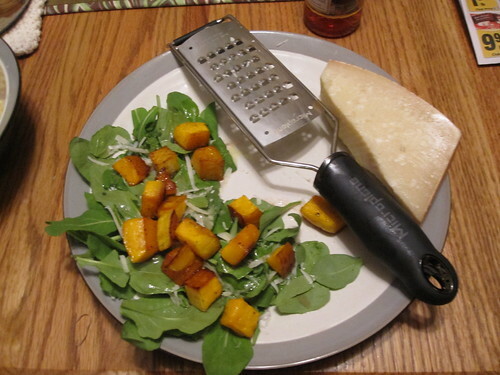 Another random first time buy: arugula, was the base of my salad. 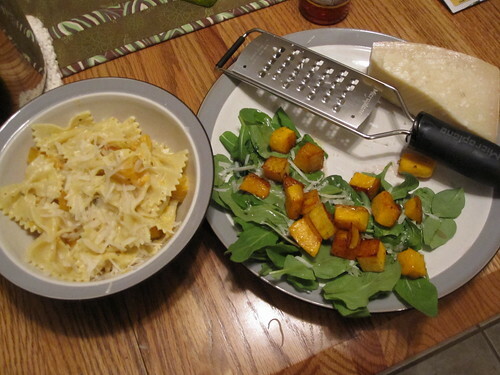 I topped with walnuts (not pictured), more grated parmesan, roasted butternut squash and a simple red wine vinaigrette. Finally I sat down, poured a glass of chardonnay, put on the new Taylor Swift album (oh, come on. i cannot be the only one! ), and partook. 45 minutes later I looked over into my messy kitchen, and immediately regretted my decision. Looks YUMMY! I love butternut squash in pasta; there is a local restaurant that has THE BEST butternut squash and roasted chicken risotto! I could definitely go for some on this COLD fall day!